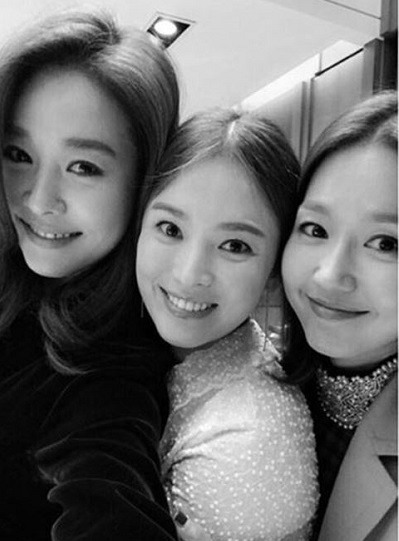 Actress Song Hye-kyo showed how much she cherished her 20 years of friendship with former Fin.K.L members Ock Ju-hyun and Lee Jin in an Instagram post Thursday. Ock attended Song Hye-kyo and Song Joong-ki’s recent wedding, congratulating them by singing “A Whole New World” from “Aladdin.” Lee has lived in the United States since getting married, but flew to Korea for the wedding. She graduated from Eunkwang Girls’ High School with Song Hye-kyo. Song Hye-kyo and Song Joong-ki tied the knot on Oct. 31. The newlyweds are honeymooning in Spain.